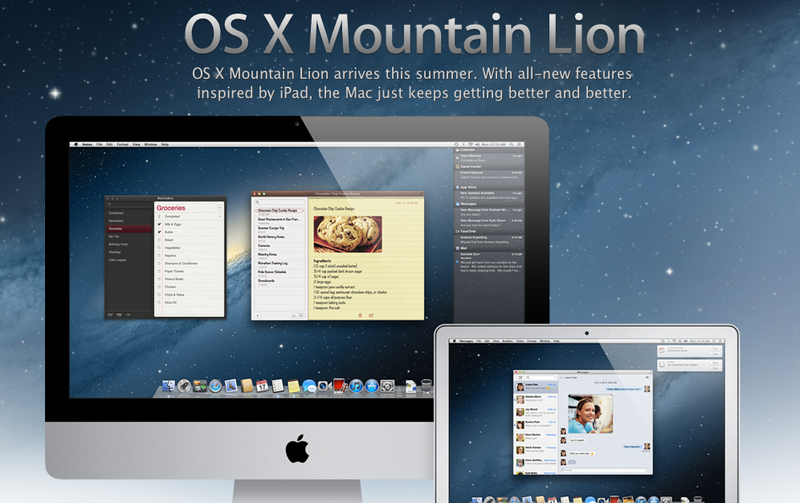 Earlier today, Apple announced the next major Mac OS X update: Mountain Lion. While unexpected, this update brings many of the awesome features from iOS, such as Notification Center and Messages, to the Mac. This update will be released over the summer. As of now, we’re unsure of pricing and an exact launch date. Below are some of the main features that were announced with OS X Mountain Lion. Since the introduction of Mac OS X 10.2, Apple has referred to their built-in IM client as iChat. This will all change with the release of Mountain Lion. Apple is transitioning from iChat to Messages. This will allow for iMessage integration as well as the standard AIM, Yahoo! IM and Google Talk integration. Want to try Messages early? Downloadthe beta! Reminders is the popular “to-do” app which is currently included with all iOS 5 devices. The Mac version looks similar with the popular leather background. Bringing Reminders to Mac will allow for better iOS-to-Mac intregration, making Reminders useful. Game Center is a way for iOS users to share video game stats and achievements with friends. Apple has decided to port Game Center to the Mac. This will allow for iOS users to play multiplayer games with Mac users as well as unlock achievements in Mac games. iOS 5 features Notification Center, an easy way to view all of your active notifications across all of your applications. Apple is bringing this over to the Mac in a very innovative manner. Notifications will appear on the right hand side of the screen, like Growl, a popular third party notification system for Mac OS X. While this may seem minor to some, Apple is now providing Twitter intregration in OS X Mountain Lion. Apple has stated that Twitter intregration will be available in Safari, Photobooth as well as many other built in apps. If you own an Apple TV, you’re in luck. Apple has announced AirPlay mirroring will be available for all Macs running OS X 10.8. AirPlay mirroring let’s you mirror your Mac’s desktop to your Apple TV wirelessly. This is helpful for slide shows and photo viewing. Notes has been on iOS since iOS 1. It’s a pretty simple app that lets you type text, nothing more. Apple has finally decided to port Notes to Mac. The Mac version is slightly different as it lets you insert images in your notes. Hopefully we will see this in iOS 6. Gatekeeper is pretty simple; it keeps you from installing harmful software. You can, for instance, only let software from the Mac App Store run on your Mac. Apple will also allow developers to “sign” their apps. This means that they can distribute their software anywhere they please, without getting caught in Gatekeeper’s gate. This will greatly reduce the amount of threats geared towards Macs. Those are just some of the amazing that OS X Mountain Lion has to offer… Now it’s your turn, what do you think of Mountain Lion? Let us know in the comments.